Fort Lauderdale is situated on the southeast coast of Florida between Miami and West Palm Beach and is known for its myriad of scenic inland waterways. You can expect to see a lot of expensive and BIG yachts as Fort Lauderdale is a major yachting center. 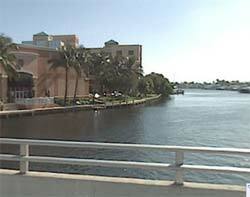 Fort Lauderdale is not just famous for its canals and beaches, it is a renowned centre for arts and culture. Las Olas Boulevard provides great shopping for the shopaholics among you and try out a gondola ride on the canals. Try the world famous Jungle Queen Riverboat which travels through the tranquil waterways of the New River giving you a chance to view the ever changing scenery, including plush waterfront homes, downtown Fort Lauderdale, great yacht and storage basins and a bit of the Everglades. Immerse yourself in sand, sun and fun on Fort Lauderdale.